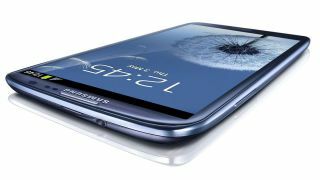 Samsung's hot new Galaxy S3 smartphone hasn't isn't even out yet in the U.S., and prices are already getting slashed with wireless carrier AT&T. Though technically it's Target and Amazon Wireless who are dropping the smartphone's price, not the carrier itself, but the sale only applies to devices bought along with an AT&T contract. Both retailers are offering the 16GB model Samsung Galaxy S3 for $149.99 to existing AT&T users who are eligible for an upgrade. New AT&T subscribers can still get in on the deal, though with a less impressive discount, seeing the price down to $189.99 when bought with a service plan. Neither retailer lists an end date for the deal, but Target has the sale listed as available today, June 15. The deal is proving popular, as Amazon Wireless is listing the phone as backordered, which Target is promising to ship by June 28. One thing is for sure, the Android 4.0 phone will be well supported by Samsung, as the company has already pushed out a firmware update before release. The Galaxy S3 sports a 4.8-inch display, 8MP camera, Snapdragon S4 1.5 GHz dual-core processor, 2GB of internal RAM, and either 16GB or 32GB of storage. The official U.S. release date for the Galaxy S3 changes depending on the carrier. The latest rumors have Verizon Wireless releasing the phone on July 9.